Saudi Aquaculture Society has been incorporated by virtue of a resolution issued by Saudi Council of Ministers on 14.03.1434 AH, corresponding to 06.02.2012 AD as a national society of an artificial personality and independent financial liability. It works under supervision of Ministry of Agriculture and it's headquarter is Jeddah. 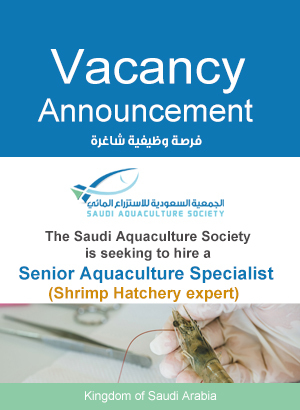 Contribute to the development of a sustainable and competitive global aquaculture industry in the Kingdom of Saudi Arabia, capable of providing safe and high quality products with competitive prices and produced by environmentally responsible procedures and generating a profitable return on investment. 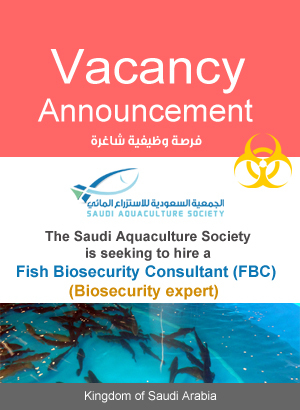 Work to enhance the role of sustainable aquaculture industry as one of the main elements in the development of the Kingdom of Saudi Arabia, and to contribute substantially to the national economy and employment, and create investment opportunities by adopting environmentally sound methods consistent with the laws and regulation in force.